In the winter of 1982, my friend Newton Carvalho invited me to inspect the failure of the cofferdam for Norte Dam, which was under construction at that time on the Itajai river, in Santa Catarina, Brazil. 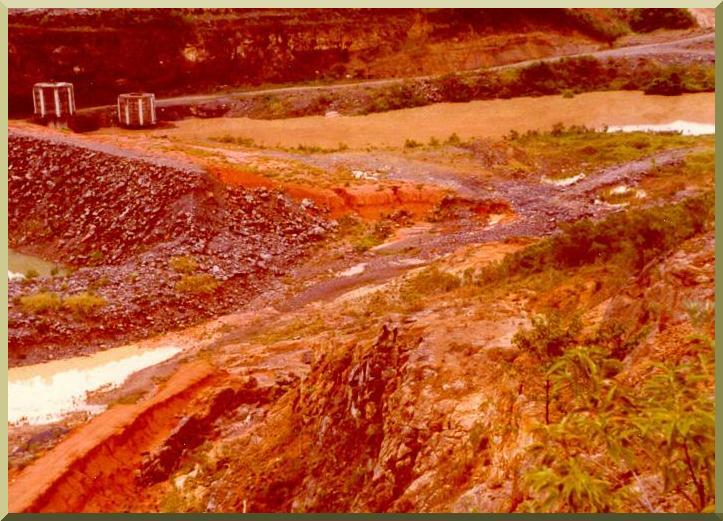 The dam was being built by the Departamento Nacional de Obras Sanitarias (DNOS) [National Department of Sanitary Works]. The cofferdam had failed because an unusual storm event followed on the heels of a drought. Thus, the storm mobilized an extraordinary amount of debris, which clogged its two Morning Glory spillways (see photo below). The same day of our visit, a meeting took place at the damsite between government officials and representatives from a local Indian reservation. I attended the meeting as an observer. The dam's spillway had been sized using the 10,000-yr design flood, a return period roughly comparable to the Probable Maximum Flood in the U.S. The Indians protested that the design flood would place a portion of their lands under water. They wanted the project stopped or at least changed so that it would not compromise their lands. The government countered that the risk of flooding was real, but that it was extremely low; and that it was a small price to pay for the flood control benefits to accrue to the downstream valley. The dam was built anyway, and the 10,000-year flood is still waiting to happen. (Note the two Morning Glory spillways on the upstream right margin).